Hiendure's 4 Piece All-In-One Bath Set is a wonderful way to update your bathroom with one easy step. 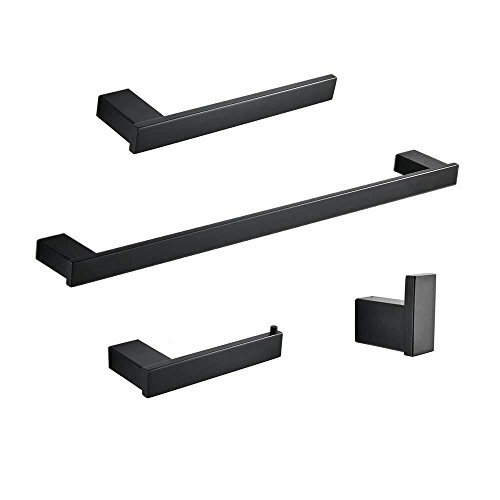 Complete with towel bar, towel rack ,robe hook, and toilet paper holder in matt black, your bathroom will look streamline and welcoming. While the pieces complement each other you can split this set up and use it throughout your home. The 23.6" towel bar makes an excellent towel holder. The towel rack would be great in your kitchen. The tissue roll holder would work in your bedroom. HEAVY DUTY: All metal construction bathroom hardware kit, ensuring quality and longevity. RUST PROOF: Construted of Type 304 premium grade stainless steel, with black painting to protect against corrosion & rust. NO RISK:Backed by Hiendure's 5 years' Warranty.If you are not satisfied,you can return it in 30 days!